For many years Paasche Airbrush Company has been manufacturing durable equipment for airbrush painting. 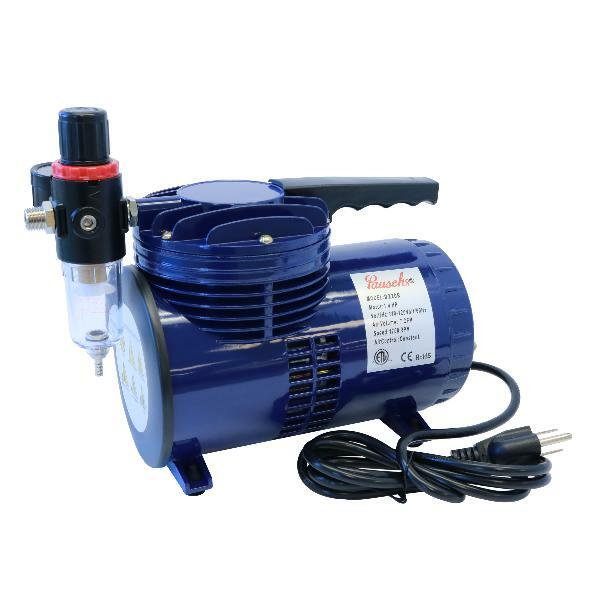 The company provides airbrush compressors, airbrushes and various details for ideal work of their products. Despite the fact that the manufacturer uses high-quality materials for their products, the goods are cheap and affordable. Moreover, you can save up to 50% of the purchase price by shopping for Paasche products in our store. Paasche air compressors are favored by artists throughout the world because they are easy to assemble and operate. If you are searching for a user-friendly, compact and quiet compressor, the D220R model is a perfect choice. You can apply this compressor not only for painting but also for any hobby you have. The device guarantees proper spraying of fluids, thus, providing very smooth coverage. Besides, it suits airbrushes that need high air pressure as it is able to deliver up to 50 PSI. The compressor is equipped with the R-75 regulator to control the pressure level. When the pressure reaches its maximum, the regulator activates and turns the device off. Thus, the auto shut off helps to prevent the motor from overheating and premature failure. Excess moisture can cause rust or corrosion of some parts of the compressor, so it’s necessary to avoid such consequences. That is why the apparatus has the moisture trap for absorbing condensate that appears inside the device. As a result, both of these parts, the regulator, and the moisture trap expand the service life of the motor. In comparison to Paasche 1/5 HP models, the D220R compressor is more powerful providing 1/4 HP. That allows the device to create more effective compression and maintain it for longer operation periods. Then, the compressor adjusts the pressure easily without sputtering, keeping the smooth running of the motor. Another important feature that will attract you is the quiet operation. The noise level is similar to a quiet suburb, a conversation at home or a refrigerator, so you’ll barely hear the device work. It’s perfect for a finicky job and suits well for those who want to be in peace and silence.